The school owners jokingly call it 'El Palacio' because it is known as the building that five former Colombian presidents used to get dressed and prepared for their inauguration ceremony. IH Bogotá is located in a brand new building in the heart of the financial district, surrounded by restaurants, cafes and bars for all budgets and walking distance to world-class shopping malls. The school is close to a number of Universities meaning it has a large student presence. It’s also close to “Rosales” and “Nogal”, some of the most traditional neighbourhoods in Bogotá. El Dorado International Airport is a 30-minute taxi ride away! As for its facilities, the newly renovated building has 4 storeys, 11 spacious classrooms, a student lounge with computers available for students, easy wheelchair access, parking facilities and WiFi throughout! The intensive course includes 20 lessons per week in a group with a maximum of 8 students. The course is available for all levels with a minimum duration of one week. If you already have some knowledge of Spanish, you can start every Monday. There are special starting dates for complete beginners (see below). The lessons usually run from 09:00 AM to 01:00 PM with a break of 20 minutes in between. Executive host family includes private bathroom. The price mentioned is for an airport transfer upon arrival for one person. Flights should arrive between 08.00 and 21.00. If a transfer is required out of these times the cost will be increased by 50%. In 2019 the school is closed on: 01/01/2019, 07/01/2019, 25/03/2019, 18/04/2019, 19/04/2019, 01/05/2019, 03/06/2019, 24/06/2019, 01/07/2019, 20/07/2019, 07/08/2019, 19/08/2019, 14/10/2019, 04/11/2019, 11/11/2019, 08/12/2019, 25/12/2019. A discount is given if the school is closed for 2 consecutive days. The language school offers a course for those who need to expand their knowledge of business Spanish. The purpose of this course is to improve Hispanic work-related activities, such as participating in meetings, negotiating and selling, making presentations, etc.. You will also expand and improve your business vocabulary and gain insight into the nature of the cultural differences that you may encounter while doing business in Colombia. This course combines an intensive Spanish course of 20 lessons per week with 10 individual lessons that focus on business Spanish. Instead of taking an intensive group course, you can also opt for private lessons. The content, times and starting dates may be determined after consultation. That way you create a customized course and may pay attention to the language skills you want to further improve. This course is available at all levels from beginners to very advanced and to students of all ages. Staying with a host family is the ideal way to make the most of your stay in Bogotá. This way, you will really get to know the Colombian way of life, the local food and culture. Your stay is in a single room with breakfast or half board. What could be more fun than experiencing a new culture? 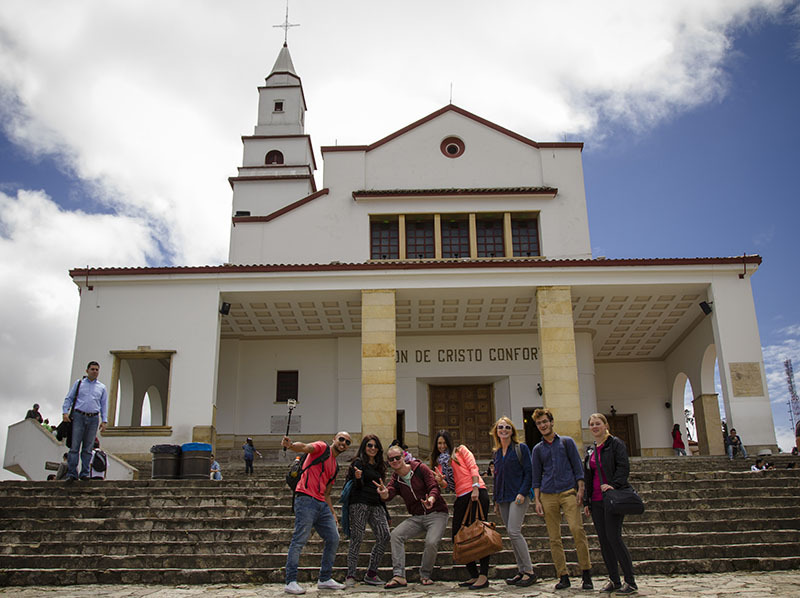 By staying with a host family, you will really get acquainted with the Colombian way of life. Your stay is in a single room with breakfast or half board. In an executive host family you will have a single room with a private bathroom. You can choose accommodation with breakfast or half board. You can choose to stay in a studio apartment for exclusive use or for two people, if you are traveling together with someone. These studio-apartments are based on self-catering, so no meals are provided. They are located within 5-20 minutes walking distance from the school. Usually they include a bedroom, bathroom, living and dining room with equipped kitchenette, all utilities, Wi-Fi high-speed internet connection, a flat screen cable TV and a cleaning service twice a week.